Issue 94.2 of the Bulletin of the John Rylands Library contains a very special article by Ben Pope of the University of Tübingen. The article, titled ‘The Empress, the Elector and the Painter’, examines Rylands German MS. 2, a sixteenth-century armorial in the Library’s collection that Dr Pope has identified as a previously unknown work by the workshop of renowned Renaissance artist Lucas Cranach the Younger. Dr Pope shows that the armorial was produced for Elector August of Saxony, and that it was copied from an earlier armorial of c. 1500 that had been in the possession of Lucas Cranach the Elder. 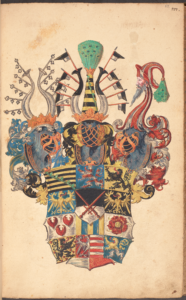 Much of the original content and structure of this ‘old armorial’ has been preserved in the Cranach copy, and on this basis it can be located in a late-fifteenth-century south German tradition of armorial manuscripts. The old armorial was also closely linked to the Habsburg dynasty, and appears to have been dedicated to Bianca Maria Sforza, second wife of Holy Roman Emperor Maximilian I. Cranach’s copy therefore opens significant new perspectives on the relationships between aristocratic women and heraldic knowledge, and on the artistic patronage of Maximilian and Bianca Maria’s court. Dr Pope’s extensive and richly illustrated article is available to read for free for one week (18th-24th February 2019). It draws attention to a previously unstudied item from the Library’s extensive collection, which continues to be a source of inspiration to scholars from around the world. The armorial itself can be viewed here.